It is a document aimed at helping countries where rabies is present to begin implementing rabies control programmes to reduce the number of human rabies cases with the eventual aim of eliminating canine rabies from an area. 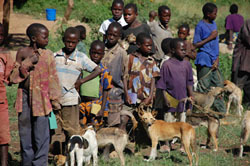 Part I (www.caninerabiesblueprint.org) focuses on the control and elimination of canine rabies. Part II (www.foxrabiesblueprint.org) deals with wildlife rabies focusing on the red fox. Part III (www.rabiessurveillanceblueprint.org) gives guidance on establishing good surveillance practices for any type of rabies. The Global Framework for the elimination of dog-mediated human rabies, finalized in 2016, set a strategic vision of zero human deaths from dog-mediated rabies by 2030. As global support builds to work towards this vision, the Canine Rabies Blueprint provides a central access point to information and resource for countries and all stakeholders to use as they progress towards the 2030 goal. next page: 1.2.	Who is it for?